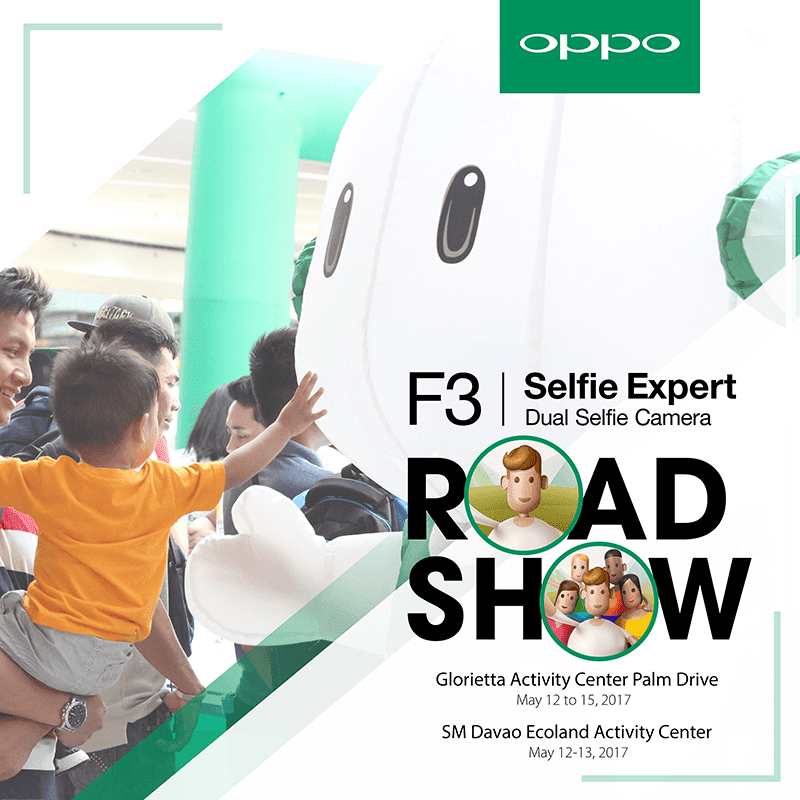 More than a week after its grand Philippine launch, OPPO is going on a roadshow with the new OPPO F3 dual selfie camera phone for groufies across the country. The roadshow will kick-off in Makati City at the Glorietta Activity Center from May 12 to 15, as well as Davao City at SM Ecoland from May 12 to 13. As a quick recap, the OPPO F3 is the company's latest #SelfieExpert with dual front cameras. Like the higher-end F3 Plus, the F3 is equipped with a 16 MP + 8 MP front facing cameras with beautify, selfie background blur effect, and super wide angle mode for groufies. On top of that, the handset is packed with stylish design, capable specs, and long battery life. Also, OPPO is giving away up to PHP 2K of freebies which includes a Bluetooth headphones and selfie stick for pre-orders made by May 12. OPPO has stated that, interested buyers can sign up at any OPPO concept or dealer store by providing their name, address, contact number, and a P1,000 down payment. They can then pick up their unit and giveaways at the store where they pre-ordered starting May 13 after settling their balance. Fans of OPPO may also look forward to selfies and groufies with actress Ella Cruz at the F3 Road Show in Makati during the first-day sale on May 13.